The United States sent the Soviet Union a lot of equipment via Lend Lease, which was authorized by "An Act to Promote the Defense of the United States", (Pub.L. 77–11, H.R. 1776, 55 Stat. 31, enacted March 11, 1941). While the Soviets were not US allies when the Lend Lease Act was signed, it later was expanded to cover the USSR. On Oct. 1, 1941, People’s Commissar for Foreign Affairs Vyacheslav Molotov, British Minister of Supply Lord Beaverbrook, and US Special Envoy Averell Harriman signed the First (Moscow) Protocol which extended Lend Lease to the USSR. The Chrysler Detroit Tank Arsenal. The Soviets loved Lend Lease, and its quick termination in 1945, in fact, was one of the factors chilling relations between the Soviets and their former Allies. It since has become a matter of national pride whose World War II tanks were best and, more to the point, a hot topic of war gamers who want to know how to win their video games. We are not talking about the "best" tank of World War II, that's like arguing over which political party is better (and, truthfully, comparing these two tanks elicits similar reactions). The T-34 wasn't even the best Soviet tank of the war (though it was the most important). Let us instead simply compare the T-34 and the Sherman tank and see what we come up with. Soviet Sherman tank in Romania. Beginning in the winter of 1943, the United States sent the Soviets about 7,000 tanks, about 1,386 of which were M3 Lees and 4,102 M4A2 Sherman medium tanks (hundreds were lost on the Arctic convoys). The Soviets used the tanks they were given and said "Thank you very much." They put the American tanks into their units alongside their own tanks. Some interpret that as meaning that the Soviets loved the American tanks and perhaps thought they were better than their own tanks. We shall see. 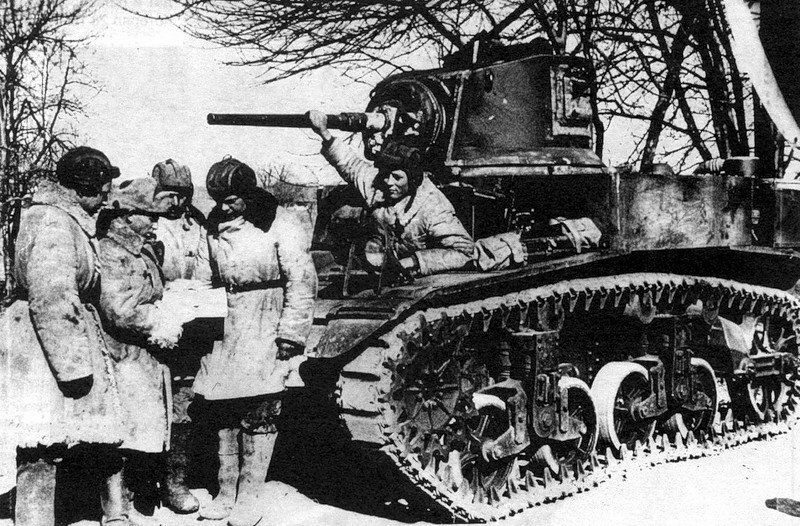 An M3 with its Soviet crew. The one fellow can practically put his hand around the barrel, try that with a late-war tank! First off, the Soviets did not like all American tanks in terms of battle-worthiness (though they were undeniably more comfortable than Soviet tanks). The Allies rushed to send whatever tanks it had in 1941, with the British sending the Matilda and the US sending its M3 Stuart. The Soviet hated that the M3 used gasoline (made it a fire trap, plus diesel was much more plentiful there) and the pitifully weak 37mm main gun. The Stuart was the main US tank at the time (it only began production in March 1941, the Lee later in the year), though, so the Americans sent 1,665 Stuarts and about the same number of Lees while they worked up other designs. Regardless of your view of the Sherman, note that the M3 came along after the T-34 (first produced in September 1940) and still is viewed today as being vastly inferior by virtually everyone. Basically, the Soviets thought that the Lee had good basics in terms of suspension and other parts - typical good American engineering - but overall was a poor design for a modern tank. 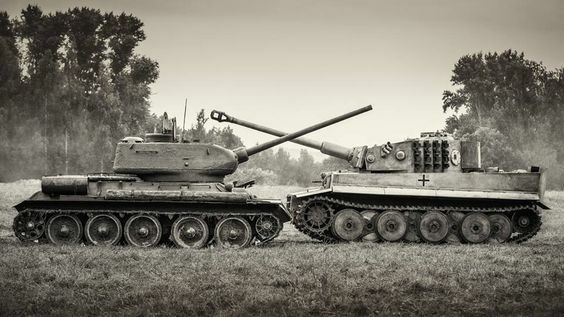 The Panzer IV was more than a match for them, let alone Panthers and Tigers. The Soviet nickname for the Lee was "Coffin for seven brothers." By 1944, putting them up against modern Wehrmacht tanks was suicidal. The Soviet evaluation of the M3 begins ringing themes that are common to M4A2s as well. But, admittedly the M3 was no Sherman M4A2, we'll get to those below. Only a slightly better turret traverse mechanism. Given the 30-cylinder Chrysler engine - 30 cylinders! - the Soviets said "Nyet" to the M4A4. Simpler is better in the field - something the Germans needed to learn, too. That leaves the M4A2, or "Sherman III" as it is known in England, as the only competitor to the T-34. We will do a comparison below. First, though, let's address the Guards unit argument. Fans of the Sherman tank like to point out that the Soviets used Shermans in their Guards units, and that this means they viewed the Shermans as "superior" to their homegrown tanks. The Soviets liked to differentiate certain units with honorifics or evocative designations such as "Shock" Armies; on 18 September 1941 they began calling some units that had fought well "Guards" units, along with a related place name. The "Guards" designations was given to formations that distinguished themselves in battle, such as at Stalingrad, but they were not composed of either picked troops or equipment. The term Guards became a synonym for "elite," and even Hitler began to use the term, but that is a misleading association. Hearkening back to Imperial Russian formations, the term was useful as part of the Soviet strategy to motivate troops to fight for "Mother Russia," which was popular, as opposed to fighting for the Communist government, which was not quite as stirring. The clear implication, and the perception of some later historians, is that these units therefore had "better" armor. That is not accurate. 1st Guards Mechanised Corps rides one of its Sherman tankss into Vienna. Getting clear information about Soviet formations is tricky. A lot must be gleaned from "memoirs" written under the Soviet regime - there are no captured documents and former prisoners happy to share their knowledge in return for favors - but the designation "Guards" was not quite as "elite" as some like to think (and as some Soviet tankers from Guards units want to make it appear). People make too much of the Guards honorific. The Guard title was awarded to 6 tank Armies, 12 tank corps, 66 tank divisions and many other units. By comparison, the entire US Army only had 90 Divisions in total, so the designation was not that special. It is often said that Guards units were used in important operations - but so were regular units, that's how they became Guards units and why the number of Guards units ballooned over time. 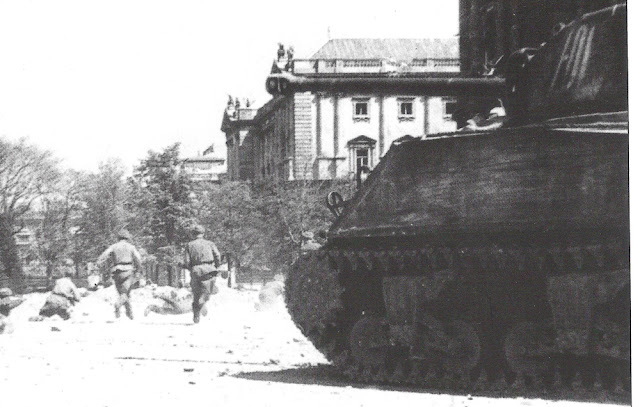 Men of the 1st Guards Mechanized Corps gets off its tank a1-01 and take Maria Theresia Platz, Vienna. True, Guards units tended to be larger than normal units, with extra battalions and so forth (at least as the war wore on). They had better morale (always nice to feel superior to your comrade units even if the pay is the same) and perhaps fielded better recruits simply due to the recruiting power of honorifics. 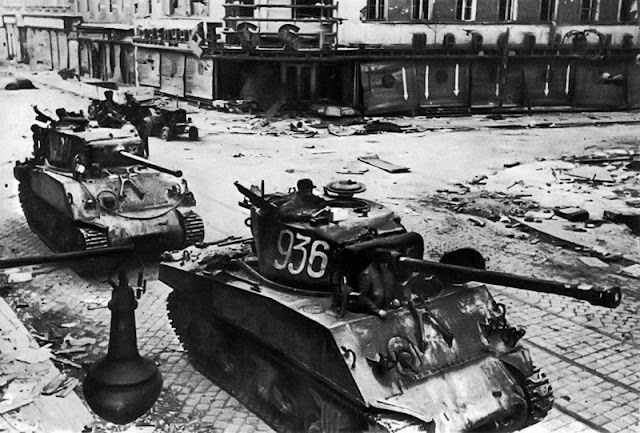 Soviet tank divisions were smaller than German Divisions (at least on the force tables), and even a Guards Tank Corps was only roughly equivalent to a German tank division, so we are not talking about huge units here. Looking through Soviet orders of battle such as at Kursk, the Guards units are intermingled at random with other units - they were not like the US Army Rangers or German SS Divisions or Italian Blackshirts, controlled separately for unique operations. Some units, such as rocket launcher ("Guards Mortar") formations, automatically received the "Guards" designation simply because they were more valued. There is no evidence that Guards units in general received better equipment than other units, though they may have received different or more equipment at times - for instance, more automatic weapons. M4A2 (76) Sherman tanks of 1st Battalion, 46th Guards Tank Brigade, 9th Guards Mechanised Corps, in Vienna. That said, many Sherman tanks did find their way into Guards units. As one source notes, as of 16 April 1945, 2nd Guards Tank Army had 184 M4A2s. Fair enough, this prestigious unit had Shermans. However, it also had 260 T-34s. Some units had only T-34s, a few had all or primarily M4A2s. The Shermans do not appear to have been given special treatment. The deeper you get into this, the less of a distinction that you find between use of T-34 tanks and M4A2s in the Red Army. The evidence suggests that the Soviets simply classified both their own T-34 and the Shermans as medium tanks and allocated them pretty much interchangeably, without regard to quality. While some Guards units appear to have been composed mainly of Sherman tanks, this was more for purposes of standardization (repair, training, etc.) and not a commentary on their quality. 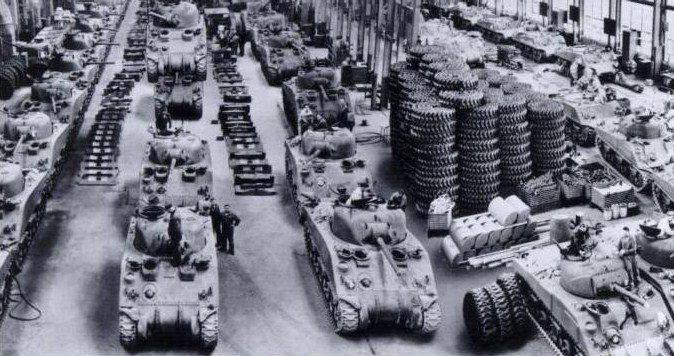 It just makes logistics easier to group similar tanks together. In other words, pointing to the use by "Guards" units of certain equipment is a red herring if you are using that to say the weapons they used were somehow better. So far, we have established that the Soviets viewed the M4A2 as the best American tank. It had a 75 mm M3 L/40 gun and GM6046 twin 6-cylinder diesel engine. The Soviets took to replacing the 75 gun with their own 76.2mm F-34 gun of the T-34 medium tank to create the M4M, though ultimately they figured it wasn't worth the effort since the Americans were supplying the ammunition for the 75mm gun as well. The Sherman main gun was comparable to that of a Panzer IV in 1941/1942, good but not exactly awe-inspiring by the time they began reaching Soviet units in 1944. A M4A2 with a 76mm gun in Berlin. 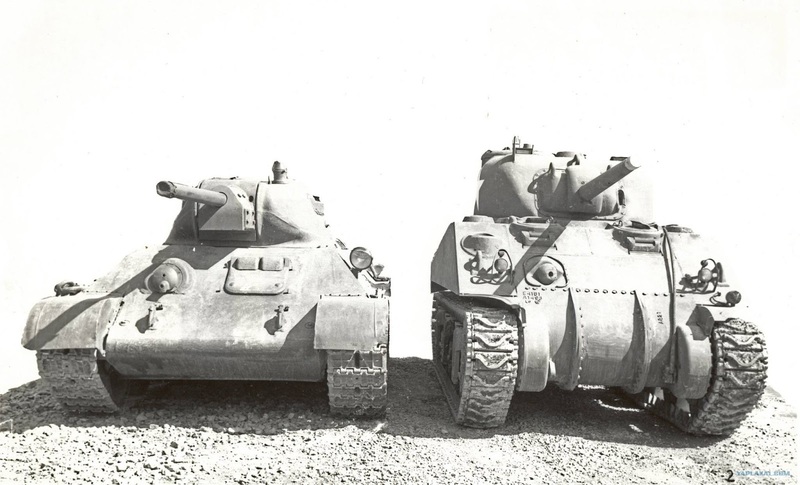 Comparing early-war T-34s and late-war Sherman tanks is like comparing apples and oranges. The T-34 was a pre-war design and, as such, saved the Soviet Union in 1941. Thus, in those terms alone, the T-34 was more valuable to the Red Army. The Soviets already had a supply of T-34s when the Germans launched Operation Barbarossa. The Stavka craftily held them back and only unleashed them in October 1941, when Moscow was threatened. They astounded the Wehrmacht and proved that the Panzer IV was not going to cut it. This set in motion their plans to create the Panther and Tiger (which Hitler had been thinking about doing since the Battle of France anyway, apparently). 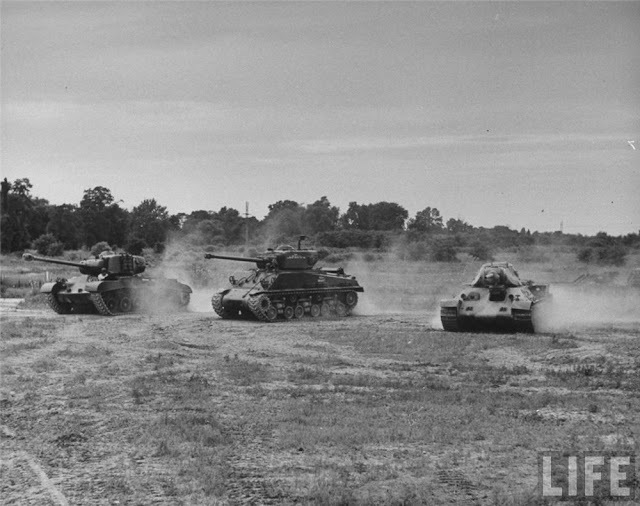 From left: M47 Patton, M4 "Sherman"A3E4, Soviet T-34/76B at the Aberdeen proving grounds. 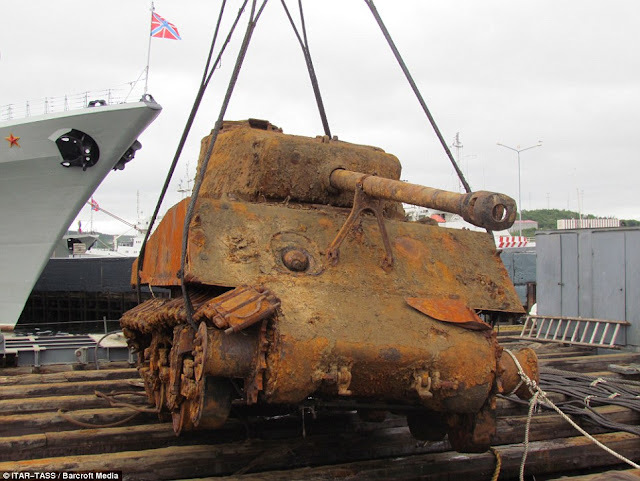 The Shermans, on the other hand, only began arriving in the Soviet Union in the winter of 1943. Very shortly thereafter, in February 1944, the Soviets began manufacturing the T-34/85 with a S-53 main gun, and by mid-1944 the T-34 was using the 85mm ZiS-S-53. In other words: practically from the moment the Shermans began arriving, the Soviet T-34 was using an 85mm gun as opposed to the Shermans tanks' 75mm (or 76mm). There is no question which gun is better: the T-34 clearly had far more firepower by mid-1944. The British also took to swapping out the Shermans' main gun, too, to create the Firefly - a much more effective weapon. 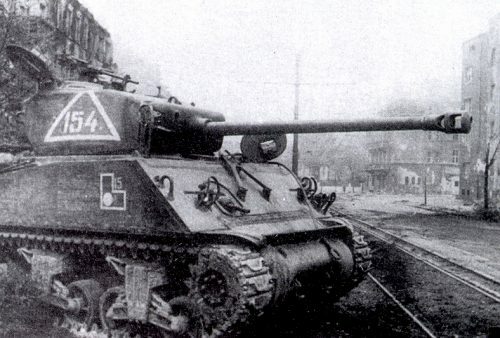 In short, the Sherman was under-gunned by the standards of the ETO when they reached the Soviet Union. Sherman Firefly tank of 2nd Irish Guards, 31 August 1944 (© IWM (BU 302)). 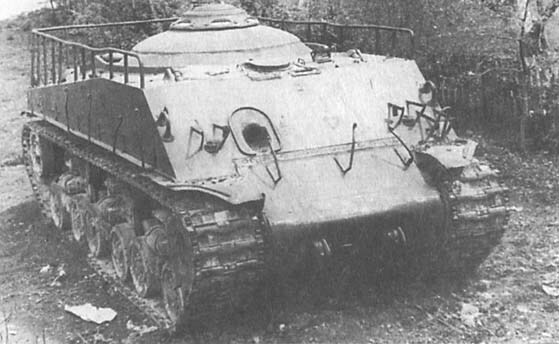 In terms of armor, the T-34/85 had the same thickness as earlier versions. The hull sides were 40 mm, the hull front went from 47-60mm. The Sherman, on the other hand, had side armor of only 30 mm and hull frontal armor of 76mm on the front and upper glacis. However - and this is a big however - the T-34 frontal armor had a much deeper slope, giving it greater protection from head-on shots. 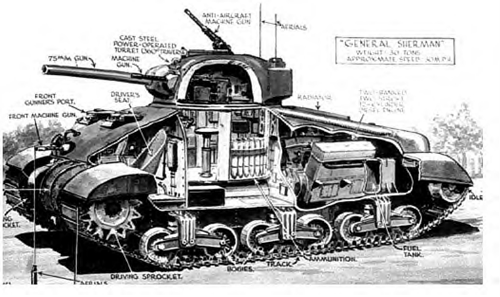 The Germans copied this in their later tanks, so they saw the benefits of sloping armor that the Sherman was lacking. As a general rule of thumb, a gun of a certain caliber will penetrate armor of similar thickness - an 88mm gun will penetrate 88mm of armor and so forth - so neither the T-34 nor the Sherman could stand up to a Tiger II equipped with a 88mm main gun from any angle - or even a Panzer V Panther main gun. However, given its better sloping design and thicker armor, the T-34 had better armor than the Sherman and was more survivable. The M4A2 Sherman design obviously is from an earlier generation. In addition, the T-34 has a much lower, squatter profile. That was extremely important on the battlefield of the Second World War. Sitting up higher with a boxier shape just made you a more visible target, both to other tanks and enemy aircraft. A Sherman that has seen better day. If you’ve seen movies where the people come out of the tank all aflame—I saw that. The German tank had an 88-[millimeter gun] and it just blew the General Sherman tank to pieces until there was nothing left but smoke and fire. While it might be overstating things to say that the Sherman tank was a death trap - a lot of soldiers felt that way. 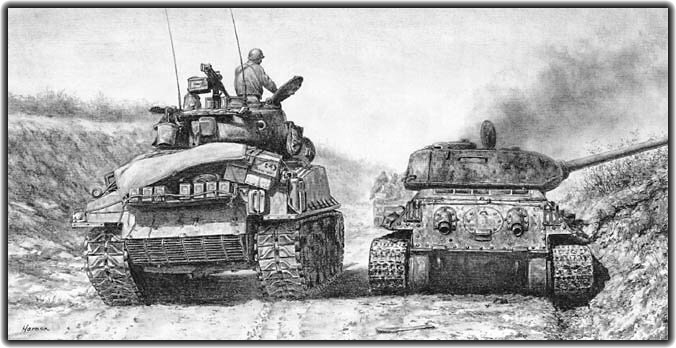 Gasoline was not always plentiful - or desired - on the battlefield, so General Patton is said to have had many Shermans converted to run on synthetic fuel. With all that said... the Sherman tank did have one big advantage over the T-34. This advantage is not apparent to the naked eye or by comparison of things like gun size or armor thickness. Our armored forces and their units frequently suffer greater losses through mechanical breakdowns than they do in battle. For example, at Stalingrad Front in six days twelve of our tank brigades lost 326 out of their 400 tanks. Of those, about 260 owed to mechanical problems. Many of the tanks were abandoned on the battlefield. Similar instances can be observed on other fronts. Since such a high incidence of mechanical defects is implausible, the Supreme Headquarters sees in it covert sabotage and wrecking by certain elements in the tank crews who try to exploit small mechanical troubles to avoid battle. This Stalin Order does not specify the tanks involved, but one may surmise that the majority of those broken-down tanks must have been T-34s. While Stalin was a suspicious, paranoid, brutal man who instinctively felt that the problem was sabotage, the very evidence that he sets forth in his order actually supports another, more obvious interpretation. Late model Russian T34 with 85 mm gun compared to German Tiger 1 fitted with the 88 mm. Soviet manufacturing after the great resettlement of factories to the Urals during the first winter of Operation Barbarossa was over-strained, to put it mildly. The plants were turning out a lot of tanks, but in very difficult conditions. 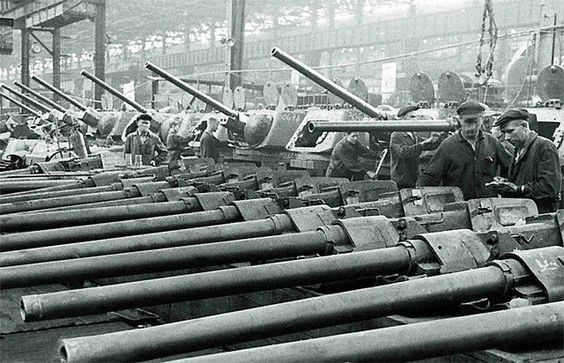 There were stories of tanks being built in factories that were still under construction and did not yet have roofs, for instance, or even walls. And this in the middle of winter. In Siberia. The point is that the US tanks may not have been elegant or up to the highest standards of the Russian Front - but they ran. Americans knew how to make reliable engines and drivetrains, the greatest problems with armor on both sides. Their quality was of the highest standard, being built in undisturbed and brand new factories by a well-rested and well-fed labor force. The Americans also had access to raw materials that were difficult to come by in Europe, and their production standards were acknowledged by everyone to be top-notch. The Soviet inspectors never had any issue with the quality of Sherman construction - only with their overall design and outfitting. Russian T-34 tank production in Chelyabinsk. So, those who view the Sherman as better than the T-34 do have a leg to stand on, but it probably is not the one they think. A mediocre tank that runs is worlds better than an excellent tank that breaks down by the side of the road during the battle. The Sherman might be a deathtrap when confronted by a German Tiger or Panther - but it did get you there and back. Maybe you would get lucky and not be blown up. Any soldier will tell you that 99% of military life even during wartime is spent outside of battle. During those times, the Sherman was a joy compared to the T-34. A wry Russian joke about American tanks is that they were better - in peacetime. They were more comfortable and gave you fewer problems. 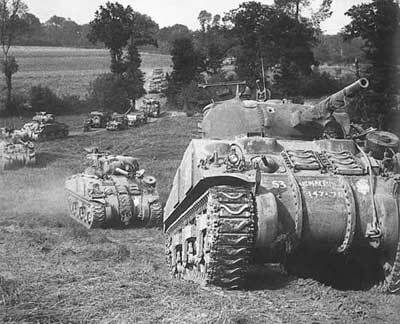 Despite design faults, the Shermans were reliable, plentiful and could be counted upon. And, in warfare, that counts for a lot, especially when you are dealing with very large numbers of tanks and your main advantage is quantity. Just looking at specifications never tells the whole story. The literature is full of weapons that had fantastic specs and which failed miserably in their intended role (the Me 163 Komet is a prime example). Let's see what people who actually worked with these weapons one way or another thought. "Don’t cannibalize, for Okh-Wa.Pru, captured by I/Pz.Rgt.5." Tunisia, 1943. The finest tank in the world. It was the most excellent example of the offensive weapon of Second World War. [T]his was the first occasion on which the vast superiority of the T-34 to our own tanks became plainly apparent. 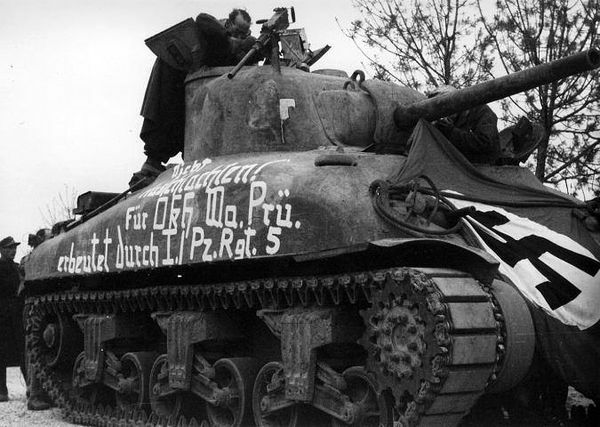 The German tanks had a qualitative superiority of as much as five to one over our M4 Sherman. Cooper did not pull that number out of thin air: that actually was the general view within the Wehrmacht. When Michael Wittman was cornered and killed in his Tiger II in August 1944, it was only because he was surrounded by five Sherman tanks. 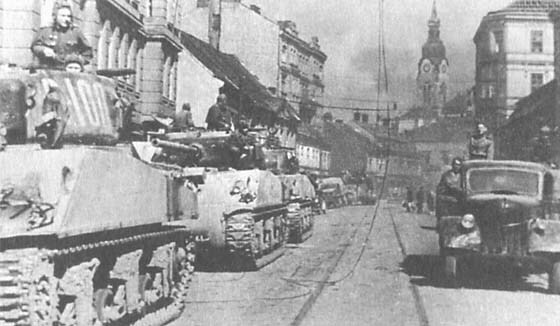 M4A2s rolling into Brno, Czechoslovakia with the Red Army. These are the best tanks for peaceful times. Conditions on the Russian Front were abysmal. The Shermans did not do particularly well on snow and ice. They also were reputed to tip over due to their high center of gravity whilst traversing rough country. 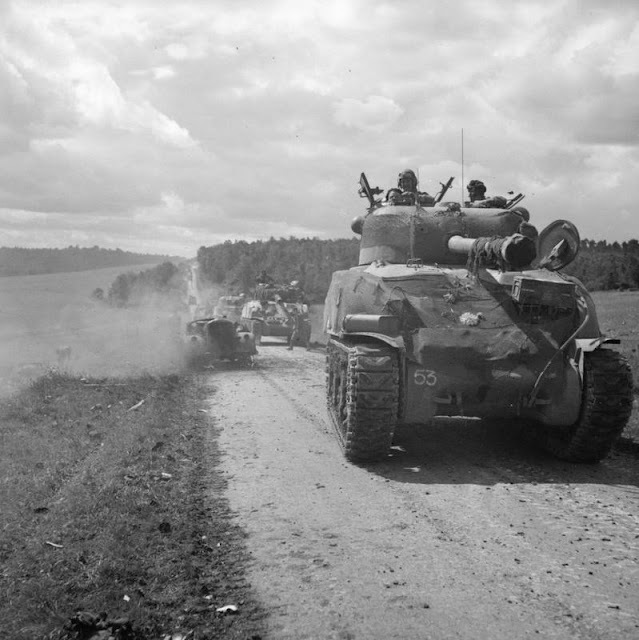 The M4A4 tank is identical to the M4A2 [in pertinent respects]... The M4A2 is well known in the Soviet Union from previously sent documents (high ground pressure, height, insufficient amount of vision devices, difficulty in installation and removal of components, difficulty in service, etc.)... Overall, thanks to a lack of experienced tank designers, the Chrysler factory is building tanks whose design and combat performance does not measure up to the potential of such a first-class tank building giant. With that kind of backhanded "praise," it is a wonder that the Soviets used any Shermans at all. However, there was a war on, and someone was giving them free weapons. The Red Army proved time and time again that it didn't care much about the well-being of its soldiers, just what would accomplish its objectives. The quotes conclusion shows that the Soviets only used the Sherman because it was the best of its poor Lend Lease options. An M4 Sherman tank carried aboard the USS Thomas Donaldson. The ship, part of Arctic convoy JW-65, was torpedoed by U-968 near the shore of Kildin Island in the Barents Sea on March 20 1945. The question arises: why? Why was the main United States battle tank so mediocre? After all, the engineering of US tanks was top-notch - as the Soviets themselves conceded above. Well, below is some brief history to show how, standing at a fork in the road, one army takes one fork, and another goes the way less travelled. J. Walter Christie with an early tank design. Note the sloping armor? A fellow by the name of J. Walter Christie from New Milford, New Jersey cut his teeth starting around the turn of the century designing race cars, then fire engine tractors, then, during World War I, gun carriages. He had innovative ideas such as front-wheel drive and four-wheel drive vehicles. 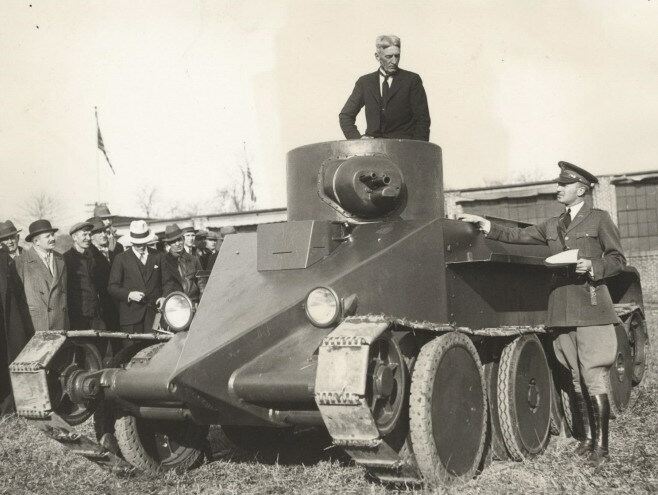 Christie gravitated into tank design after they became popular late in the war. His designs were not superb as tanks, but had superb design elements that were decades ahead of their time. In a somewhat spooky foreshadowing, Christie submitted a prototype to the US Army in 1928 that he called the "Model 1940" for being a dozen years ahead of its time. The US Army nitpicked and questioned and turned Christie down. He never could convince the US Generals and Colonels (there was one notable exception I'll get to below) that his revolutionary ideas about tank suspension ("helicoil") and speed were worth pursuing. Why the US military didn't get it... well, that's a good question. 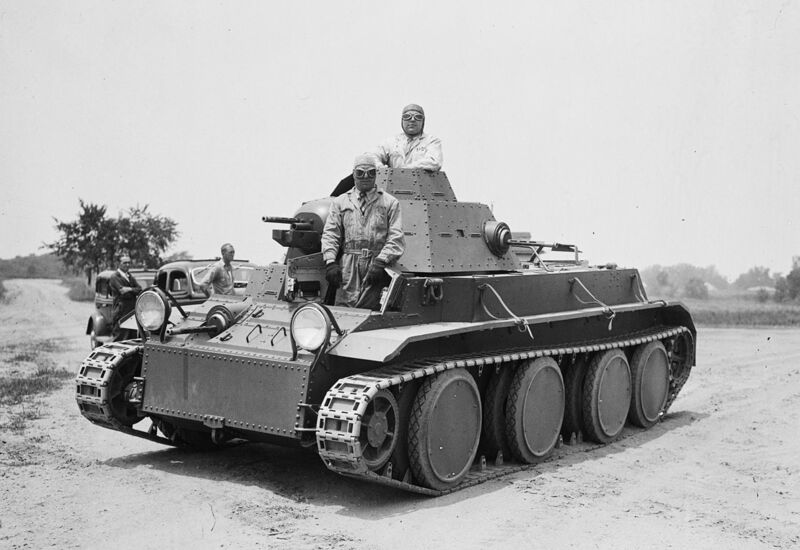 Experimental Christie T3E2 tank, shown here during tests in 1936. You can see the future in this tank (Harris & Ewing collection at the Library of Congress). The Soviets (and the British, who used Christies' ideas in their cruiser tanks) were not so hard-headed. The Red Army bought Christie's prototype and designed the BT tank series around Christie's basic ideas. 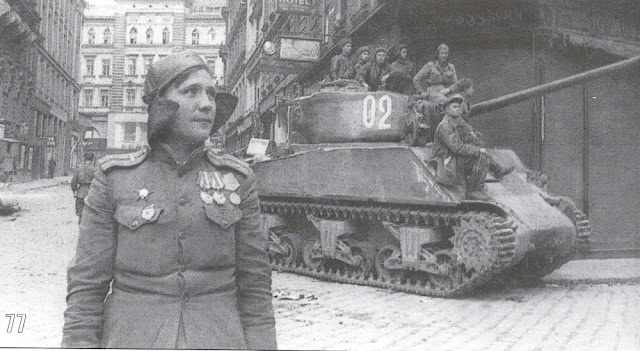 The improved version of the BT Tank series was the T-34, which began production in... 1940. Oh, and the US officer who "got it" in 1928? A fellow who went by the moniker of Lt. Colonel George S. Patton Jr., the top tank expert in the United States military and perhaps the world. Of course, he earned a few stars after that. Against those advantages must be set the better reliability of the American tanks. Both the Soviets and the Germans recognized that the T-34 was a war-winning tank. Nobody with experience against them ever said that about the Sherman tank. The advantage of the Sherman was that it was available in massive numbers, and, to the Soviets, that it was completely free of charge. While the Soviets did use them in Guards tank formations, that does not prove that they considered the Sherman tanks as being superior weapons to their own tanks. Overall, the T-34 was a better tank than the Sherman tank and the Soviets only used the Sherman because it was the best tank the Western Allies had to offer. A Sherman tank converted by the Soviets into a prime mover. A lucid and interesting article. I've often wondered why USA didn't rush to develop a new main battle tank program. I fear that it might have something to do with business contracts and cronyism, it being the USA where moneyed interests reign supreme. Thanks, I enjoyed reading this. Thanks! I try to set forth both sides so people can draw their own conclusions. Personally, I don't think it is a very close call. I think you are right about why the US tanks were so mediocre. T34 more survivable than a M4? Bite your tongue!The M4 had 3 times fewer casualties per knocked out tank. It also had a much better fire control system. The M4 would likely get the first shot and had a much higher rate of fire.